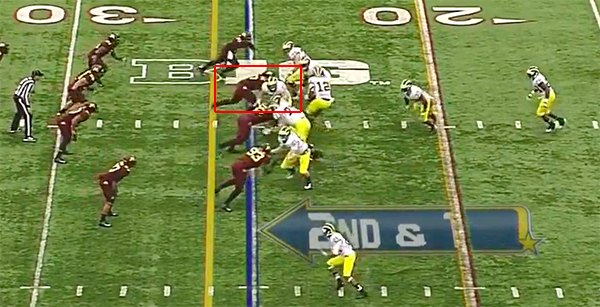 We saw yesterday how Elliott Mealer struggled to identify the proper defensive lineman to block on Devin Gardner's eventual interception. Unfortunately for Mealer, things didn't get much better throughout the day. One play in particular stood out even during the game: an I-formation run in which Gardner appeared to call an audible at the line of scrimmage, which, saywhatnow? 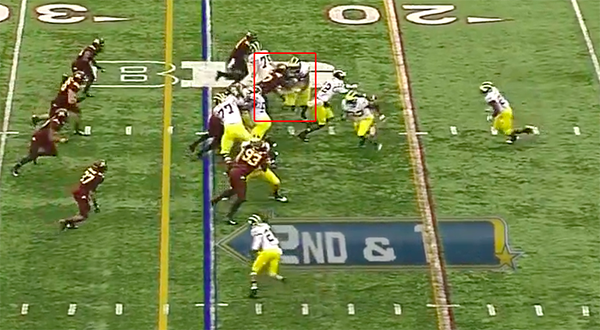 ...as the ball is snapped, Mealer totally ignores the defensive tackle (highlighted). Omameh has started to pull across the formation essentially leaving a wide-open hole for the DT to run through. 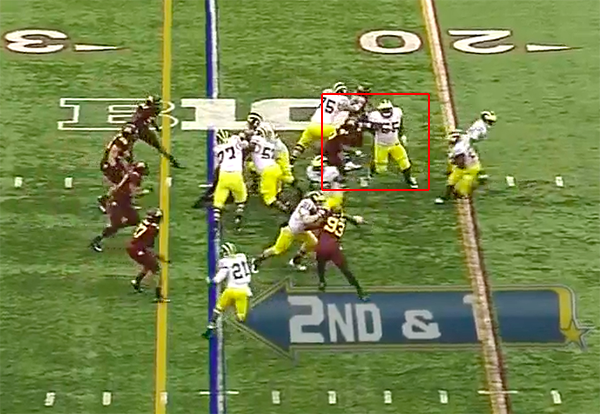 The defensive tackle is now running into Omameh, who isn't expecting contact (highlighted). Notice also that Taylor Lewan is also blocking the player that Mealer reached for, so Lewan, Mealer, and Ricky Barnum are all blocking one player. ... who runs over Toussaint in the backfield for a four-yard loss. Elliott Mealer is not working out. Mealer has struggled all season, but it hasn't been quite as apparent until this game. I don't know how much of this performance falls on the shoulders of the coaching staff (Mealer looks totally unaware of his responsibilities) and how much is Mealer just failing to get the job done. I'm inclined to think the latter because of how well the coaching staff has done with everyone else. I had high hopes for Mealer this season as someone who was recruited by Carr and finally getting the chance to work in a system like that again, but he's clearly in over his head. 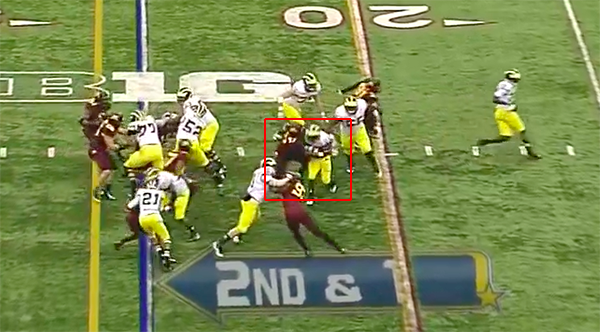 Getting beaten by a defender is one thing, but Mealer doesn't even appear to know who he's supposed to be blocking. I don't know if Michigan has any other options at center this year without burning a redshirt, but it may be time to start considering all options (at least if Michigan is back in contention for the Big Ten title). What about Jack Miller? 288 is maybe 10 pounds too light, but not impossible (assuming the roster isn't exaggerating), and it's hard to imagine that he would be worse than Mealer. It's a bit unnerving for next year if he is. 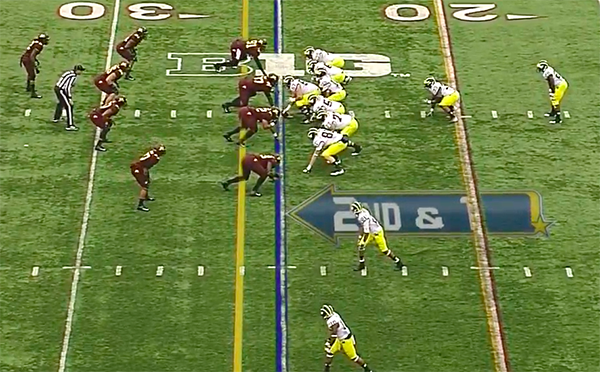 Best case scenario, your interior line next year is Miller at center and Bryant and Kalis at the guard spots. But there is 0 starting experience there and if Miller can't get on the field than we're not going to be able to run next year, either.